Tomorrow, Feb 8, is the start of the Chinese New Year. For those of you not acquainted with the Chinese New Year, it follows a lunar calendar and has a 12 year cycle with each of the 12 years named after an animal. Ex: 2005 was The Year of the Rooster, so next year the cycle will start all over again with the Rooster. It cycles through from Rooster to Monkey (or any variation depending on which year you start counting), and includes, among others, the Year of the Dog, Ox, Tiger, Dragon etc. 2016 is the Year of the Monkey. By strange coincidence, 1968 was also the Year of the Monkey. 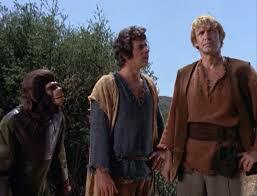 I say "strange coincidence" because 1968 was also the year that the first Planet of the Apes appeared in theaters. 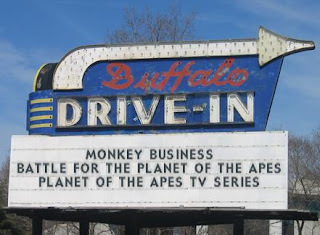 Yes, the start of a franchise that included 5 original movies, a short-lived live action TV series, and a cartoon show, also short-lived, indeed began in the Year of the Monkey. I think that it's just kismet, therefore, that , having just bought the DVD set of the TV series, and, already having the original 5 movies, that I should celebrate the new Chinese New Year with a series of blog postings on that incredible franchise. Paul Dehn, the writer of the three previous sequels was given the go ahead to produce a fourth sequel. However, health issues prevented him from completing his duties. The husband/wife script writing team of John William Corrington and Joyce Hooper Corrington were given the task. Those familiar with sci-fi movies will note it was the same writers who scripted the Charlton Heston apocalyptic flick, "The Omega Man". 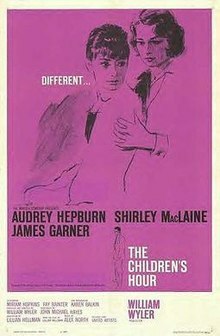 This was, going in, to be the last in the franchise, and as such was only given a small (compared to the previous four) budget of only 1.2 million. It also had a more subdued focus on the political agenda, compared to what Dehn had given it in Conquest of the Planet of the Apes. 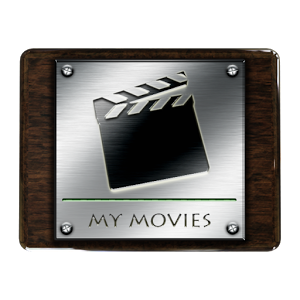 After the end of the movie series, there was still enough interest in the concept that, after the high ratings the original movies got when broadcast on TV, the green light was given to produce a TV series. 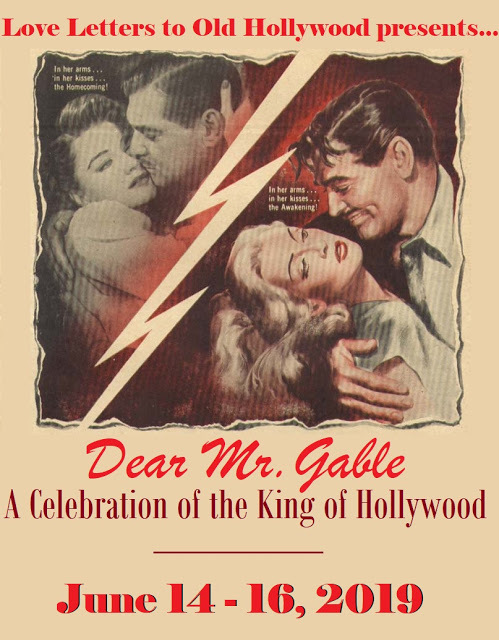 Producer of the original movies, Arthur Jacobs, had died before the concept could come to fruition. 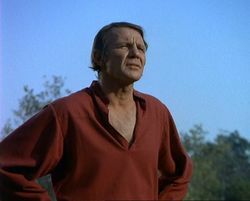 20th Century Fox acquired the rights and began promoting the idea of a series again and in 1974 CBS approved the go-ahead. After the live-action series failed to generate enough of a TV audience, the powers that be still had one more bullet in the ammunition pack. They tried to launch an animated series. The animation gave them the opportunity to do some things that budget constraints prevented in the original movie. 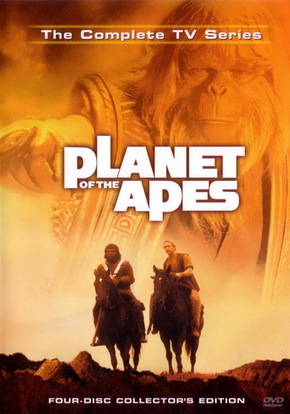 Boulle's original novel found the apes with a technologically advanced society complete with cars and airplanes and television and the like, but the budget for the original Planet of the Apes was already over budget that they had to scrap it for the more primitive feel that showed up on screen. But with animation they could show the ape planet as Boulle originally envisioned it. 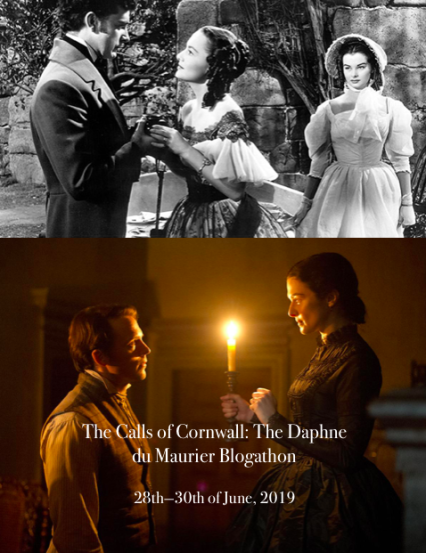 Both TV attempts were due to last only one season. The live action failure was a significant one for your author, because I was a 12 year old sci-fi nut at the time and watched every episode. But it had the misfortune of being pitted against the NBC juggernaut duet of Sanford and Son and Chico and the Man. A glance at the TV schedule for fall of 1974 (and from the hindsight of 40 years... ), suggests a better option would have been the original plan of Tuesday night, where it would have had relatively tame competition since both NBC and ABC slotted a "Movie of the Week" in that time slot. Oh, well. The last movie of the series begins many years in the future (as stated in the opening credits it is "North America -2670"). A Lawgiver (played by John Huston) relates some of the history of ages bygone with the story of Caesar (Roddy McDowell), the revered leader. 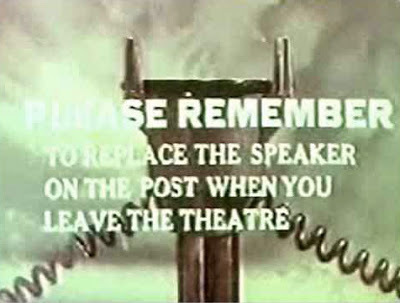 The majority of the movie occurs as a flashback. Sometime after the revolution that occurred in Conquest, a nuclear war occurred. It is never really stated how much time has passed since the nuclear war and the "present", but the key figures of Caesar, his wife Lisa (Natalie Trundy) and McDonald (Austin Stoker) do not appear to have aged much. 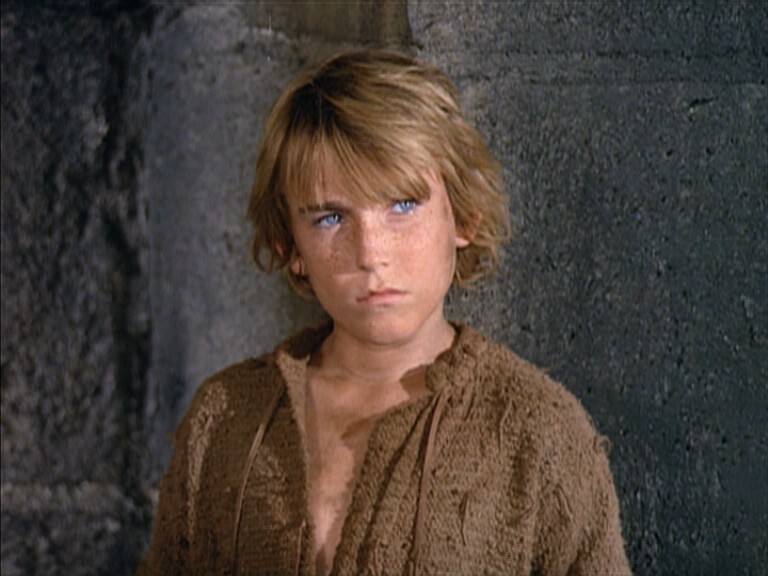 But on the other hand Virgil (played by Paul Williams) states that another ape was his teacher. 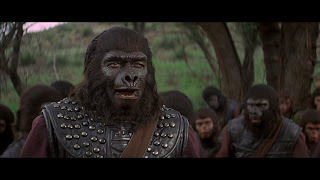 Since at the end of Conquest most of the apes only grunted and could not speak, this implies a considerable passage of time, so maybe one of the after-effects of the nuclear war was an increase in longevity of its survivors. Caesar expresses to McDonald a desire to know how his parents looked and what they thought. McDonald tells him that in the ruins of the Forbidden City there is an archives that has tapes of the interviews (seen in Escape). Caesar and McDonald, along with Virgil, who it is revealed has an extensive encyclopedic knowledge, go to the armory, which has been guarded by Mandemus (Lew Ayres). Mandemus is a very intelligent ape, the aforementioned teacher of Virgil, and a very sharp cookie. 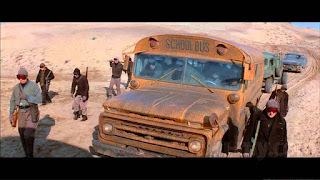 After a series of questions he allows the trio to take a small cache of weapons for security on their journey. The three go to the Forbidden City which still has elements of radiation, according to Virgil, who has brought a Geiger counter with him. Unbeknownst to them, (although Caesar has expressed a suspicion of the existence of them), they are observed by maimed survivors of the nuclear war, humans who have lived underground the entire time. The underground still has operational cameras and security systems, you see. Kolp (Severn Darden, recast from the role in Conquest) recognizes Caesar and sends agents to find them. The three manage to escape capture and get back to safety. Caesar calls for a meeting to discuss his findings in the Forbidden City. 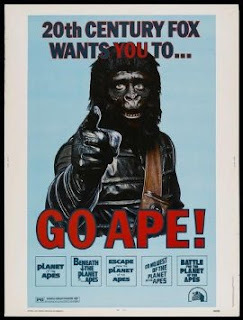 Aldo (Claude Akins), a belligerent army gorilla who has wanted to keep humans out of the decisions all along, voices a complaint that the humans should not be allowed in the ape council. Later Aldo and the gorillas plan a coup d'etat but are overheard by Caesar's son Cornelius from a tree above the meeting. Aldo spies Cornelius and knocks him out of the tree, critically injuring him. The gorillas escape without being noticed. Aldo has the humans jailed as suspicious characters and leads a defense of the city, but Caesar shows up to prevent Aldo from taking over completely. There is an exciting melee that ensues, and you won't be sure exactly who comes out on top until the end. Aside from the original movie, this one is my favorite of the 4 sequels. Claude Akins, even in his gorilla mask is a very expressive actor. And the leftover cadre of humans in the Forbidden City are not all automatons. Paul Stevens who plays the second-in-command to Kolp is a voice of reason in the war-minded community. The political overtones are more subdued, at least compared to Conquest, but they are still here. Racial acceptance and equality are the main theme. There is also a brief plea for curbing use of nuclear weapons at the end. 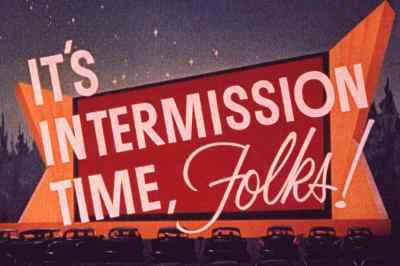 In early 1974, 20th Century Fox started re-releasing the original movies to theaters. The ensuing interest convinced executives that a TV show might draw interest. The TV series, as stated before, aired during the fall of 1974. It featured two astronauts (a third one had died in the crash). Ron Harper played Colonel Alan Virdon and James Naughton (brother to David Naughton) played Major Peter Burke. The spaceship crash lands, as indicated in the first episode, on March 21, 3085. (Although it should be noted the chronometer shown in the upper right hand side of the opening credits stops at June 14, 3085). The basis of the entire series is set in the first episode. 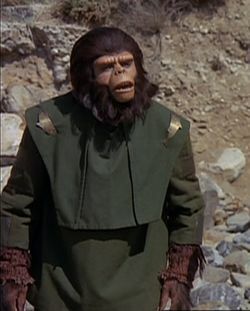 Dr. Zaius (played here by Booth Coleman) sends General Urko out to find and capture the humans, after the discovery of the crashed spaceship. General Urko however has other ideas, since he is a composite of the typical TV racist. He wants them exterminated. You may not recognize Urko by face (he is after all a gorilla), but close your eyes and listen to his voice. Yes, Star Trek fans, that is Sarek, father of Spock (Mark Lenard). 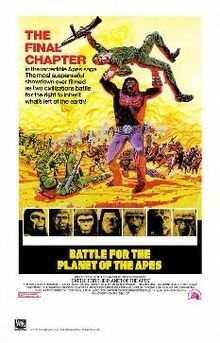 Zaius does not trust Urko and sends his assistant Galen to accompany him (played by our Apes stand-by, Roddy McDowell, who surely must have been getting tired of all those hours in the makeup chair by now...) Things come to a head towards the end of the first episode and Galen and the two astronauts escape and are on the run. This is the driving force behind the series. Each episode had one or both astronauts in some dire situation with the threat of being captured by Urko and his gorilla army. But within the main story there were several great plot lines, most of which dealt with the disparity between the way humans were treated by the superior ape. In addition, humans are not allowed to ride horses, hence the added disadvantage that the trio must always be on foot. This eliminates a premature ending to the series, too, because if it were me, I'd just steal a nearby horse and head for the hills. The fact that humans cannot ride horses makes it clear that if they did they would stand out like sore thumbs. Fortunately the humans in the TV series are not mute primitives like they were in the original, so on occasion they can blend in with the local human populace. 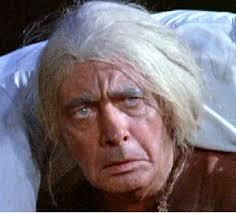 Some of the notable guest stars you may (or may not) recognize over the course of the series: Royal Dano, a familiar character actor who appeared in dozens of TV westerns. Jackie Earle Haley, who was also the obnoxious hoodlum-like Kelly in the original Bad News Bears movie. 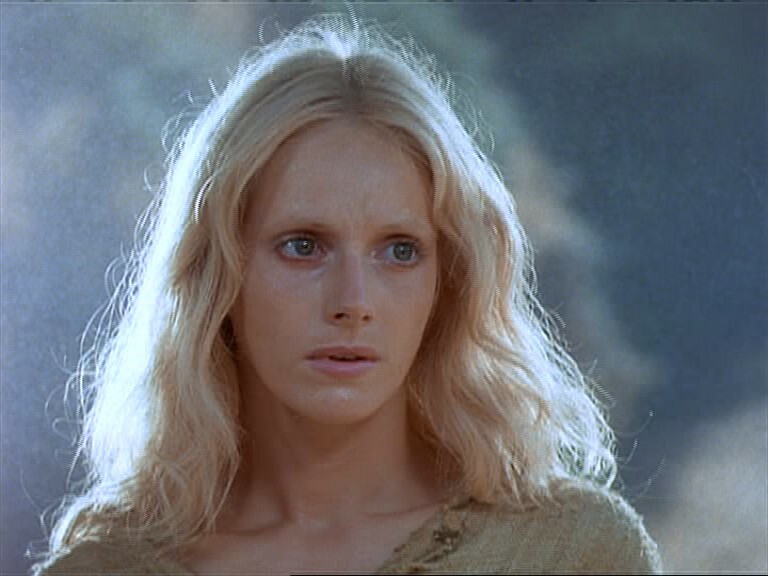 Sondra Locke, one-time love interest of Clint Eastwood. Michael Conrad, probably most recognizable as Sgt. Esterhaus on Hill Street Blues. 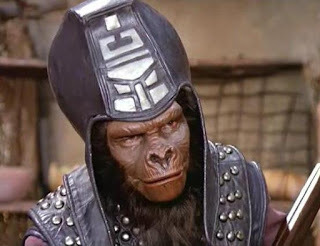 Roscoe Lee Browne who often played upper-class pompous black characters on 70's sitcoms (Browne appears as an ape here). Many more, some I don't recognize myself. It is entertaining to watch the credits and see some familiar names who were hiding behind the monkey make-up. 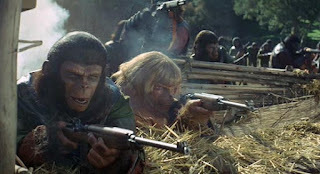 I made extensive use of pics from planetoftheapes.wikia.com for the above 5 photos. That's the view from the back seat this time, kiddies. Gotta go trade in the Plymouth Fury for a horse so I can head for the high country. Those damn dirty apes are getting too close for comfort. I actually got to meet Roddy McDowall once when he appeared at a charity event for the professional theater I worked for. He brought with him the actor John Glover, and showed us all slides of his photography. Also got him to sign one of his coffee table books of photos, which I still have. I have only met one actress, Margot Kidder, and it was at a benefit concert she was hosting. I don't get out much... Plus not many actors come to this neck of the woods. There are a handful of Hollywood movies shot here, but they are few and far between. Absolutely! Claude Akins was terrific in this film. I've never seen the series but, happily, it looks like a few episodes are available on YouTube.